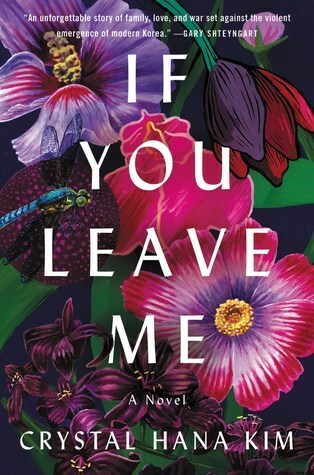 1950s and a Korea at war in If You Leave Me by Crystal Hana Kim. The country is splitting in half and Haemi feels like she's splitting in half, too. Her family has fled their village due to the fighting and they're now refugees, surviving day to day. And Haemi has a choice to make. She is in love with her childhood friend Kyunghwan and he loves her back... but another boy in the village, Jisoo, has proposed marriage to Haemi. Jisoo is well off, he can provide for her family, while Kyunghwan has nothing but dreams. Haemi yearns to follow her heart with the boy she loves, but her heart cares just as much about her ailing little brother who desperately needs food and medicine. Haemi must make a choice that will affect not only her own life but the life of her family for generations to come. And that's only the beginning. I loved this multigenerational novel set in Korea during and after the Korean War. It was a book that I just wanted to keep reading forever because I loved the characters and I was fascinated to see how their choices took their lives in different directions. Crystal Hana Kim writes with such emotion and her prose is heartbreaking; I felt like I was living the story along with the characters. Readers get the story from multiple points of view allowing us to see the story from different perspectives. The setting is just as important as the characters as there are many parallels between a country being split apart and the characters being split, caught between their desires and reality. The book brings the Korean War to life, too, illuminating how families were literally split - if your family resided north of the dividing line you would likely never see them again. This book is out August 4 - preorder now! Hand this to readers of multigenerational historical fiction. I would press this into the hands of Pachinko's many fans (Pachinko by Min Jin Lee, Grand Central Publishing 2017) or readers of The Lowland by Jhumpa Lahiri (Knopf, 2013). Readers of character-driven historical fiction set in wartime like The Nightingale by Kristin Hannah (St. Martin's Press, 2015) will also enjoy it. If You Leave Me by Crystal Hana Kim. Adult. William Morrow, August 2018. 432 pages. Review copy provided by publisher at ALA.